They were filming a commercial with Uma Thurman. 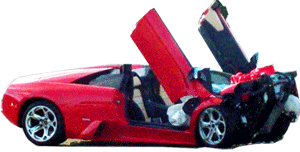 The scene involved the Lamborghini getting away while it was being shot at and doing a 180 spin out. Apparently, they disabled the traction control to help with the scene. The crash was not planned. The driver, a stunt double, lost control and hit a tree and the curb. 2004 Lamborghini Gallardo. Happened in Los Angeles, California, USA.